Happy Monday? I wish I could tell you that I got some quilting done over the weekend but that would be lying. 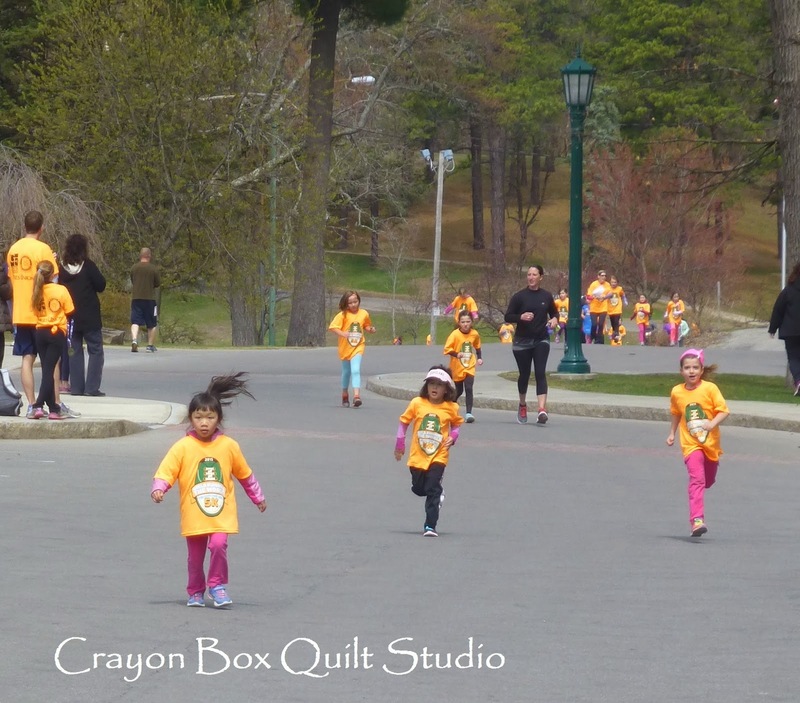 The prep work for the biannual kids' consignment sale took up a lot of my time and Sunshine participated in a Girl Scout Daisy Dash race yesterday. The course for the little girls was a lot longer than a lot of the parents were aware and I wasn't so sure her little legs would carry her all the way around. 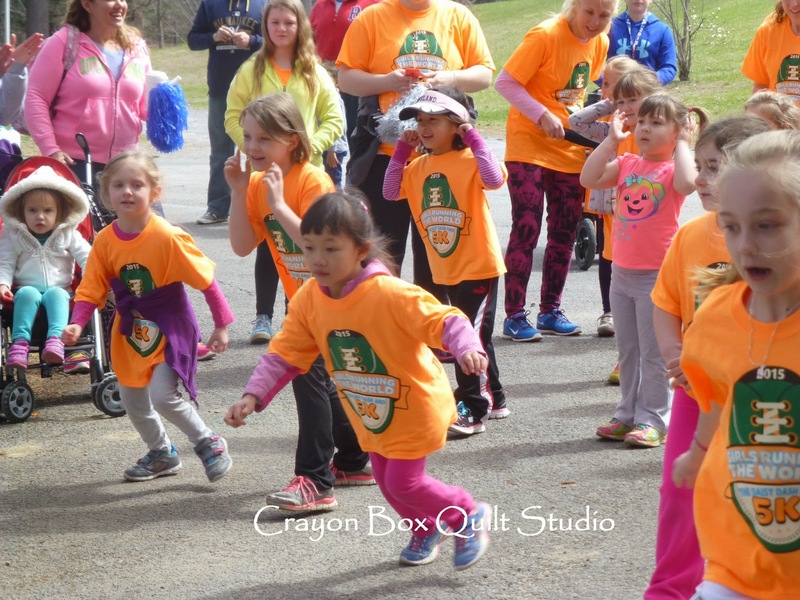 But after the first few girls came in, I was surprised to see my petite little Sunshine running along as hard as she could, ahead of many of the bigger girls. She was very determined and she truly has a competitive spirit. 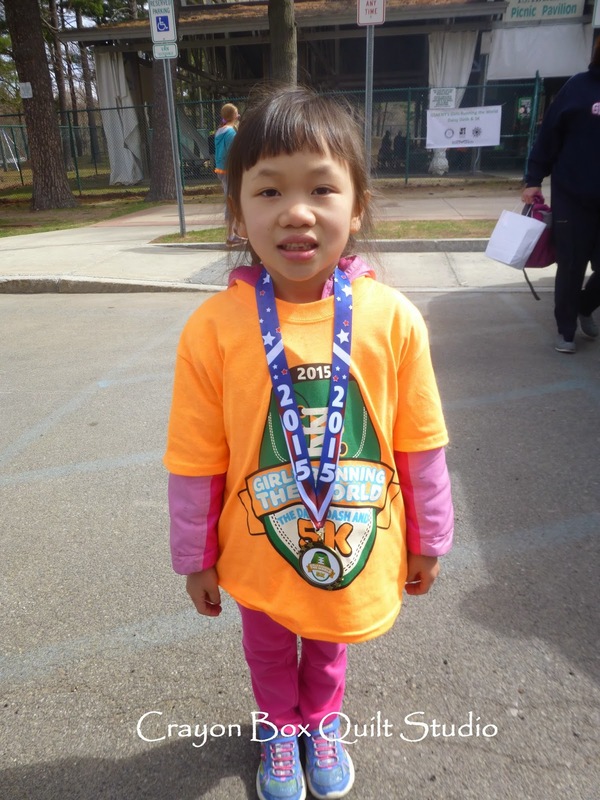 I am so proud of her accomplishment and she just loves having a medal. Nicely done sweetheart! So now are you ready to see more gorgeous quilts from MQX East? This is another stunner that caught my eye. It is "Happy Daze" and was pieced by Marti Young of Barton, VT and quilted by Flo Verge. It took a Faculty Award ribbon. I love the feeling of spinning movement from the circles. Of course, the quilting is very detailed and beautiful. A Swoon quilt is on my bucket list (maybe I'll finally start it this year) but this one is really different from others that I have seen online because of the colors used. It is titled "Racing Silks" because of the silk fabrics used for the blocks. It was pieced by Nancy Sullivan-Jacobs of Cedar Rapids, IA and quilted by Lana Corcoran. I love the design used on the background in between the blocks. This is "Floral Whimsy" by Norma J Riehm of Hayward, WI. It also won a Faculty Award ribbon. This is my only picture that came out blurry. Sorry about that but I still wanted to show it to you. It is "My Brunette Whig" and was pieced by Gail Stepanek of New Lenox, IL. The quilting was done by Jan Hutchinson and this one won the Custom Heirloom Show Second Place ribbon. The work on it, both the piecing and the quilting, is absolutely exquisite. I like that the outer flower rings were quilted differently than the center ones. "Bodacious" was pieced by Claudia Clark Myers of Duluth, MN and Marilyn Badger. Marilyn also quilted it. It took the Custom Heirloom Show Third Place ribbon. The continuing of the stars' rays in the quilting design really compliments the design. This quilt is so much fun and I love the sentiment, though if I were making it, I would have probably used bright colors because that is just more me. It is "Stop" by Michelle Plourde of Laconia, NH and was created as part of a guild challenge. Look at all this gorgeous quilting and I love the little bits of bling added. "Round Pegs, Square Hole" is by Lori East of Carthage, Mo and was quilted by Shelly Pagliai. The quilting design is more simple but very effective. Here is another masterpiece that used a variety of thread colors in the quilting. It is "Midnight Dahlia" by Gina Perkes and was pieced by Elaine Putnam. It won Wallhanging Large Third Place. Just look at all the thread colors used and the quilting detail is so very small. Amazing! The center medallion just shines. This quilt is so realistic. It truly looks like a photo instead of something created with fabric and thread. It is titled "The End of the Line" and is by Joanne Baeth of Bonanza, OR. It won both the Surface Design Award ribbon and the First Place Wallhanging Large ribbon. This is the winner of the First Place Wallhanging Small ribbon and it is "Jester's Folly" by Margaret Solomon-Gunn of Gorham, ME. Another ribbon winner, this time for Quilting Among Friends Second Place, this quilt "Shimmering Stars" was pieced by Joan Waldman, Gloria Miller and Marie Clark. The gorgeous quilting was done by Kristen Vierra of Lincoln, NE. And last for today's show is the winner of First Place Quilting Among Friends. It is called "Better Than Prozak". The piecing was done by Barbara Moran of Green Valley, AZ. The quilting was done by my online buddy Valerie Smith, whom I'm really hoping makes it to MQX next year. I have one more post to share with more gorgeous quilt pictures from MQX East so I'll meet you back here in a couple of days. Thanks so much for sharing Michele! I love that your photos focus in on the quilting details! I get so inspired to try new patterns with my quilting from what I see on blog posts like yours. I haven't made it out to MQX yet, but I'm hoping to go in the next year or so. And congrats on the great job your little girl did in her run! these quilts are just stunning and quilting them must take forever! I have a swoon top I need to quilt, no way I'm quilting it this densely! I loved seeing even more beautiful quilts. The quilting is just incredible on each one. Yay Sunshine! You did so great! Way to go Sunshine!! :) Keep striving for what you know is good and pure!! Mom, job well done on your part also. Thank you for showing and inspiring us all with all the quilt pictures. Yay! Sunshine way to go. She is adorable! More beautiful quilts. The End of the Line quilt was made by someone from my home state and I did not know that there was a town here by the name of Bonanza. I had to look it up to see where it was. I can't even imagine the hours it must have taken to make all of these quilts. Congratulation to my beautiful niece! Oh and....thanks for the "quiltspiration"! Looking at the quilts, all I can say is that I'm glad I don't have to choose the winners!